This year is the National Historic Preservation Act (NHPA)'s 50th anniversary! For the Salmon-Challis National Forest, we will join the celebration by sponsoring the McKenzie House Stabilization Project, and we want you to join us! 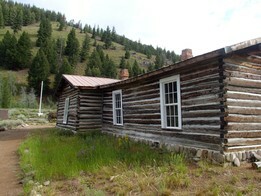 The historic ghost town of Custer was established in 1879 and is listed on the National Register of Historic Places (NRHP). The town includes several buildings: a schoolhouse, a saloon, nine residences, two stone houses (ruins) and several outbuildings. One of these magnificent structures was the McKenzie House - built in the 1880s. and considered among the finest houses in Custer. Unfortunately, one of the walls is currently failing and the building desperately needs your help to attain its former glory! See you in June!